Sometimes items pass our desks which can be very useful but just don't really necessitate a full review; it either works, or it doesn't. 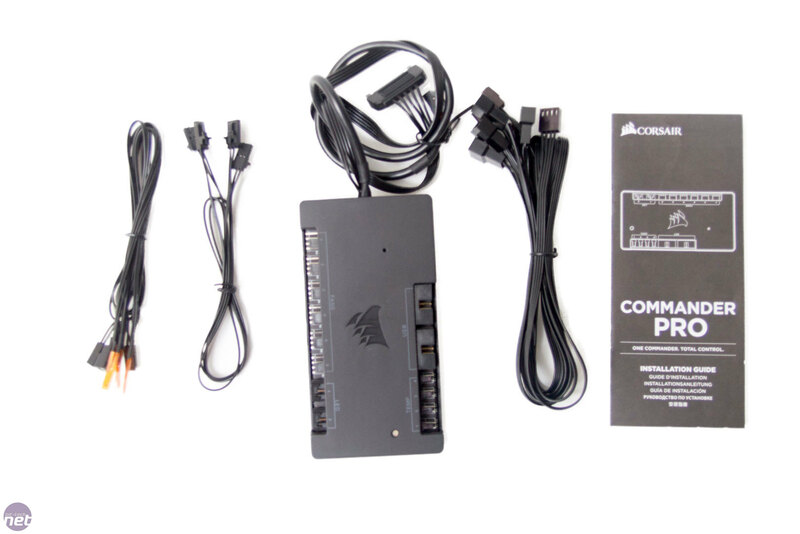 One such piece of hardware is the Corsair Commander Pro. Basically, this is a direct replacement for the Commander Mini but includes more features. It isn't often that we take pictures of packaging. After all, it's just a box to protect the product and will be discarded and forgotten about by most within minutes, but I rather like how this is done. The product in front of the company's own Crystal Series 570X chassis shows what most people will use it for: RGB. Inside the box, you get the Commander Pro, plenty of cables, and a small user guide which is rather useful. 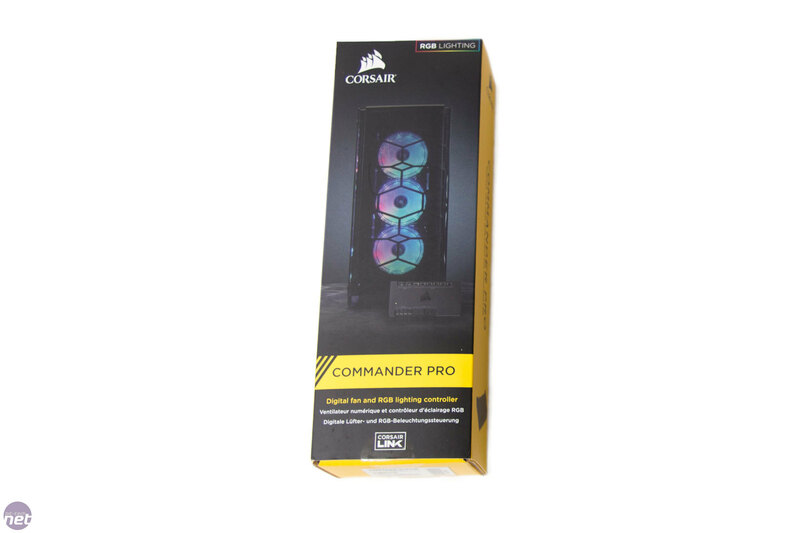 There are also two bits of double-sided mounting tape to allow you to fix the Commander Pro to your case. 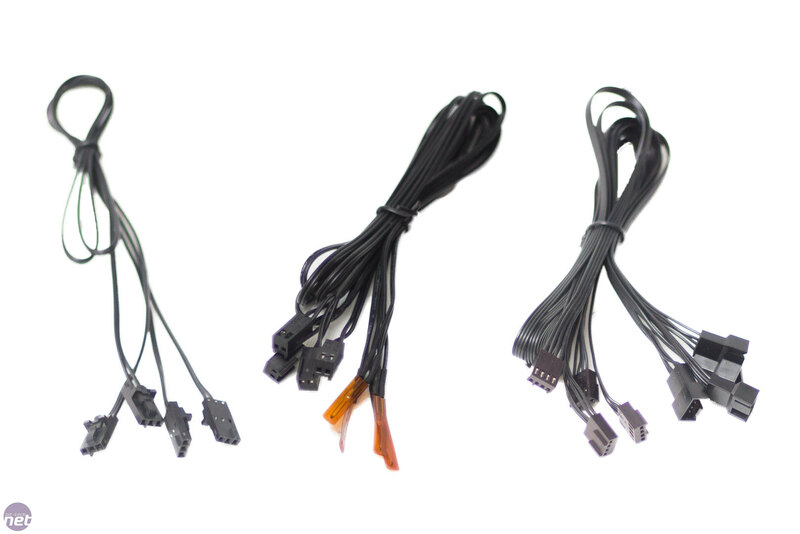 Here are all of the cables included with the Corsair Commander Pro. 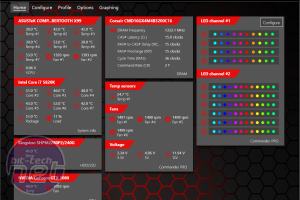 There are two RGB LED hub cables, four thermal sensors, and four fan extension cables. All of these can be plugged into the Commander Pro at the same time. The unit itself has six four-pin fan ports. 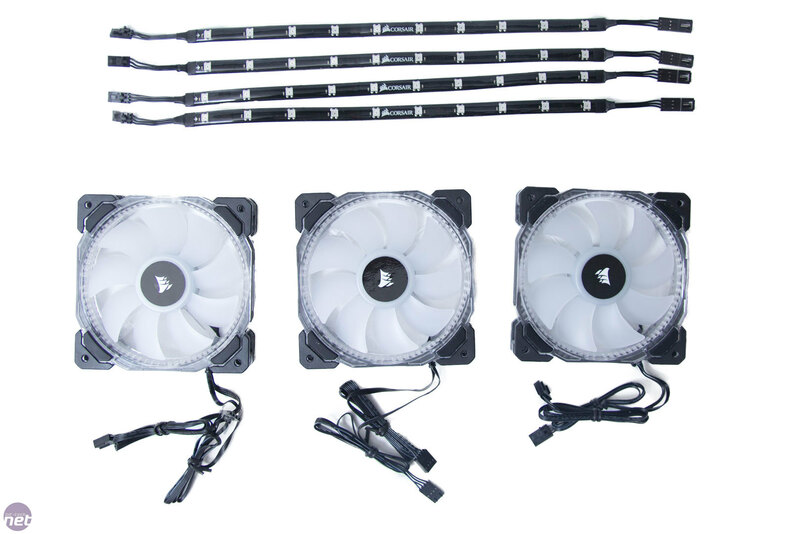 These are used to control your fans via voltage or PWM control via the Link software. 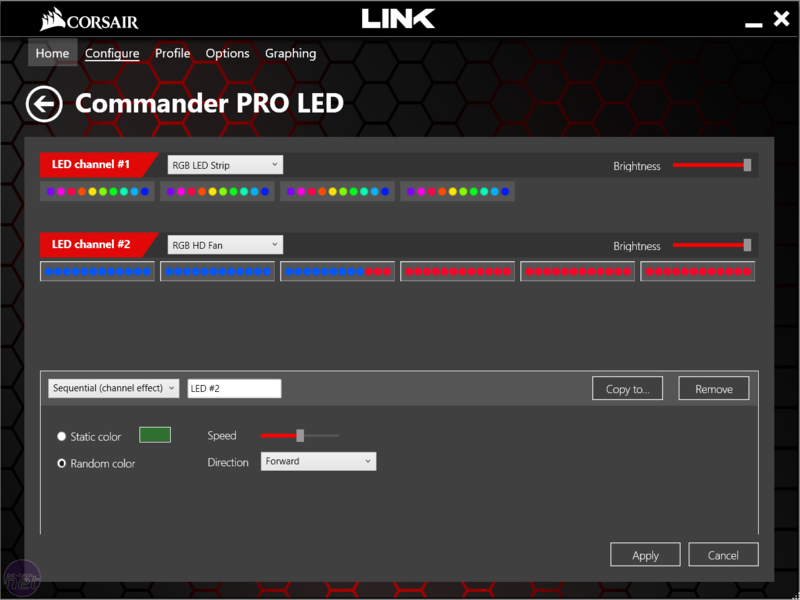 There are two LED channels granting you control of Corsair RGB LEDs and Corsair RGB fans. There are also four thermo-resistor inputs for the thermal sensors and two internal USB headers. 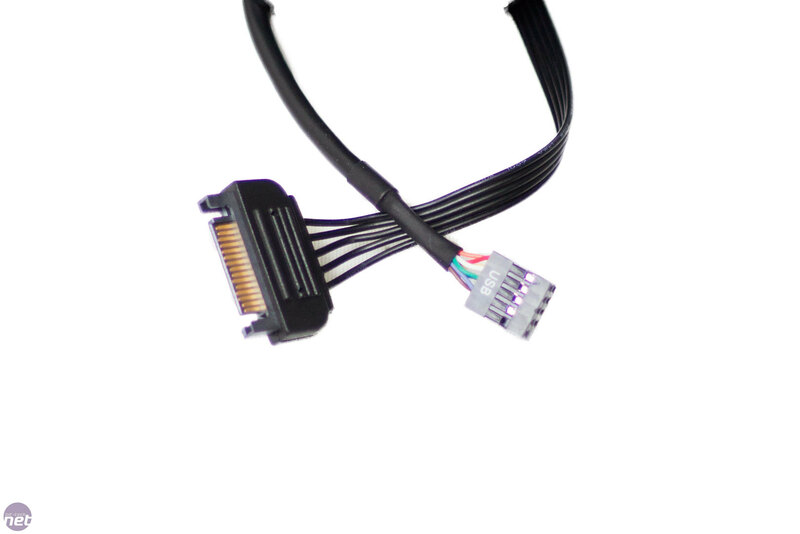 Power is supplied to the unit via a standard SATA power cable, while the other protruding cable handles data transmission via a standard USB header that you'll need to connect to your motherboard. 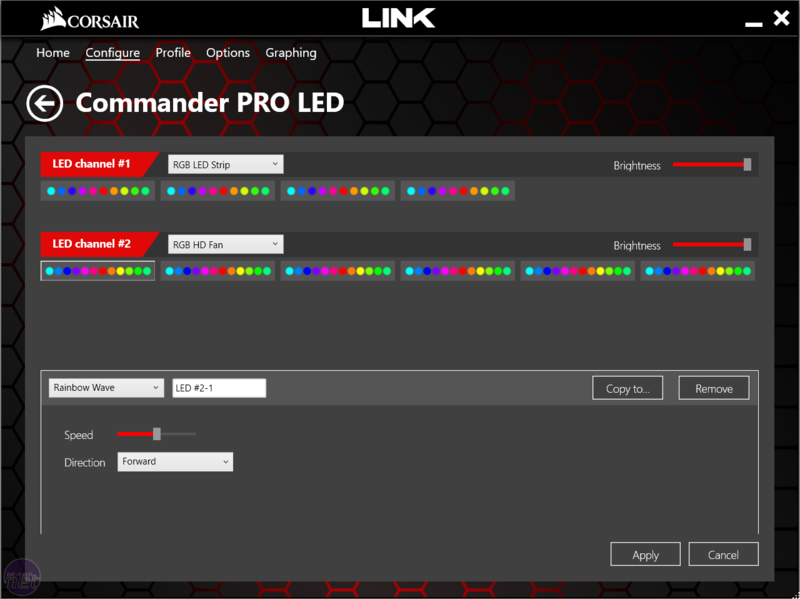 Corsair also provided us with its new HD120 RGB LED fans and the Lighting Node Pro to show off the capabilities as much as possible. The unit can power up to six RGB fans and four LED strips at once. Alternatively, you could power 12 fans and no LED strips or eight LED strips and no fans. 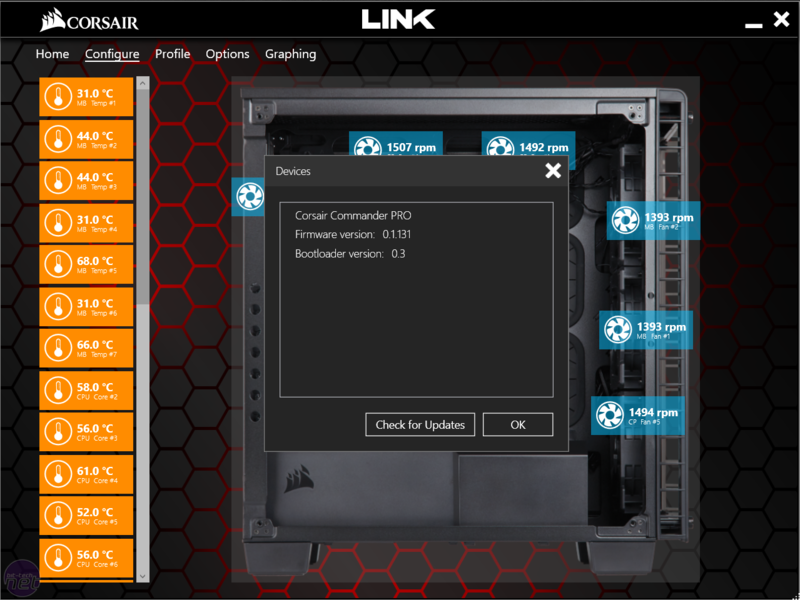 We have used the Corsair Link software in the past, and it has been quite a powerful suite. However, it is sometimes a little buggy. This is somewhat expected when it controls and monitors so many different aspects of your system, though. 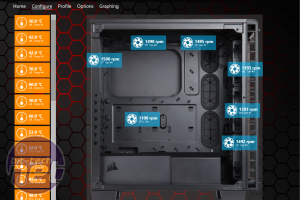 On the main screen, you have a good overview of all of your fans, temperatures, and LED controls. You can configure the software to match your system and put your fans in the correct places. 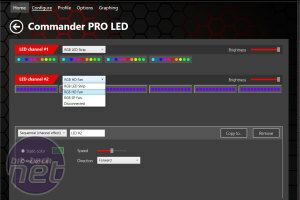 This is useful, as it allows you to easily pick the correct fan that you want to change the settings of. There are three preset profiles for your fan speeds. To change them, simply hit the 'Profiles' tab, and you can also create your own. There is also an 'Options' tab where you can change some settings such as the unit temperatures are measured in. One thing to notice is that there is a firmware update straight out of the box, so we made sure we updated before going further. 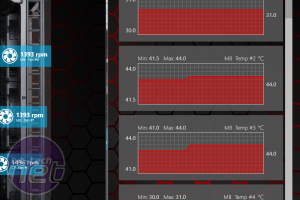 If you want to document your temperatures, you can open up the 'Graphing' tab, and this data can be logged - potentially useful for troubleshooting. 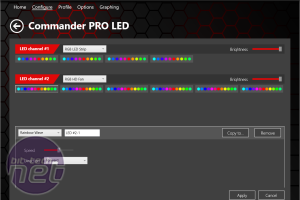 This is where the Commander Pro shines (get it?). 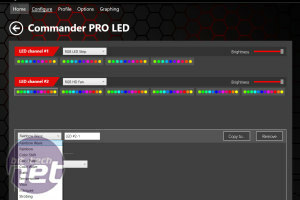 Here, you can control the RGB functions on your LED fans and LED lighting node. 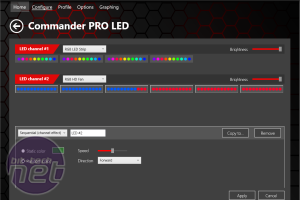 You can change the lighting mode on each individual fan or strip by just clicking on them and then selecting a mode. 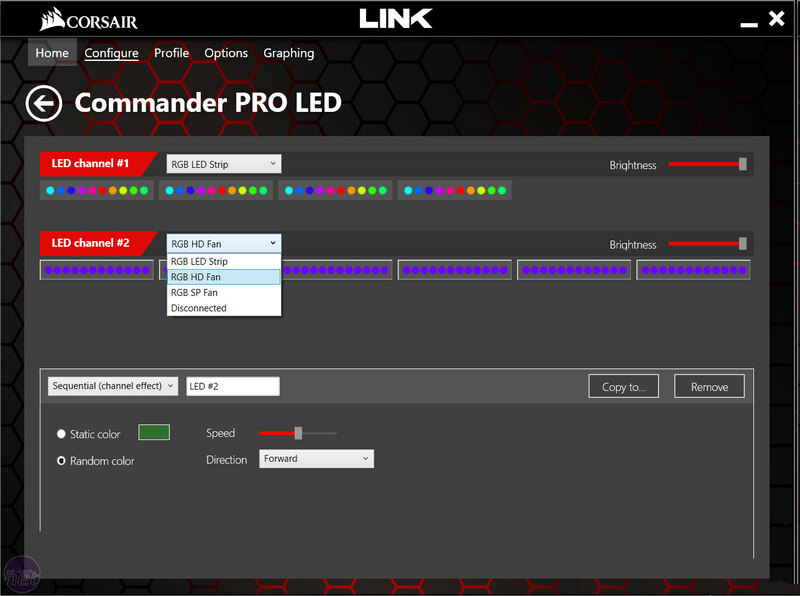 As the HD fans and the Lighting Node support individual LED lighting, you can get some really nice (or crazy) effects from the lighting, all managed through Link. 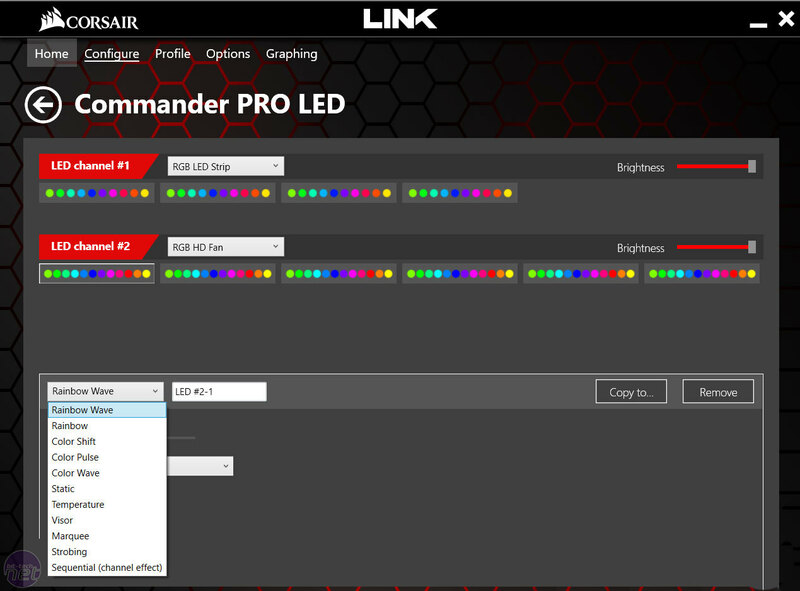 While playing with the RGB functions with the HD 120 RGB fans and Lighting Node, I decided to see what else we had knocking around that was RGB from Corsair. The answer? Everything. It is becoming apparent that Corsair really does want to RGB everything. 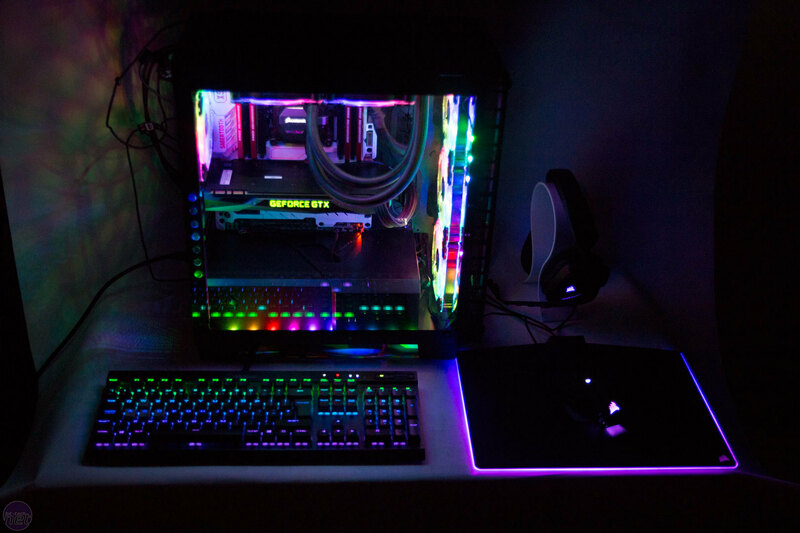 Some people really dislike it, but it's clearly here to stay, and Corsair is really looking to offer as much control over the colour scheme of your system as possible. 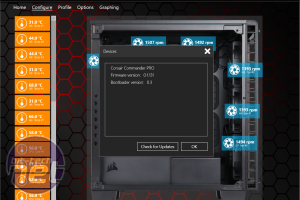 The Corsair Commander Pro helps you to do just this. 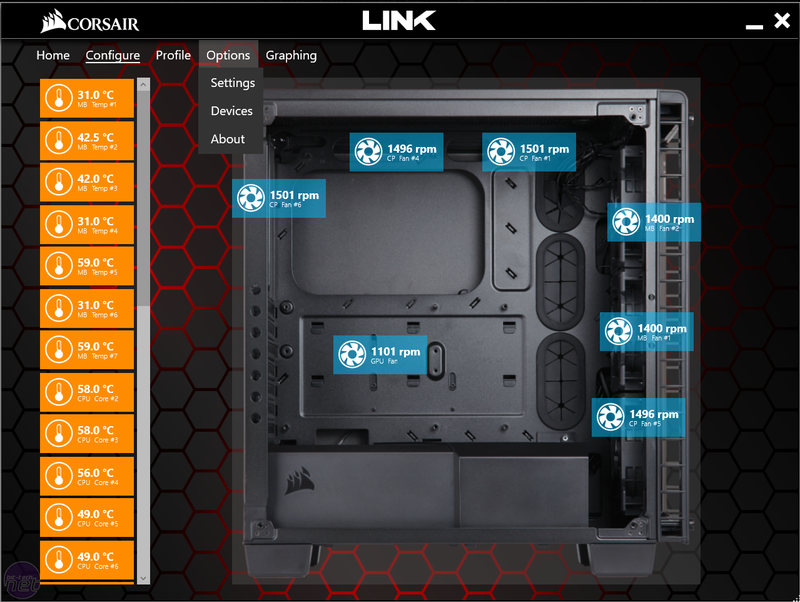 It gives you complete control of your PC’s cooling, monitoring, and lighting. 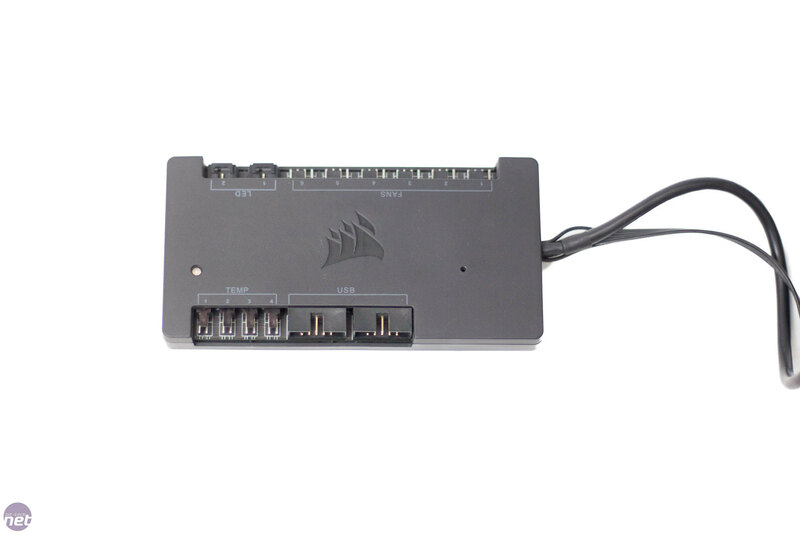 Six four-pin PWM fan headers provide total control of your cooling fans from dead-stop to maximum speed and anywhere in-between using programmable fan curves in Corsair Link. 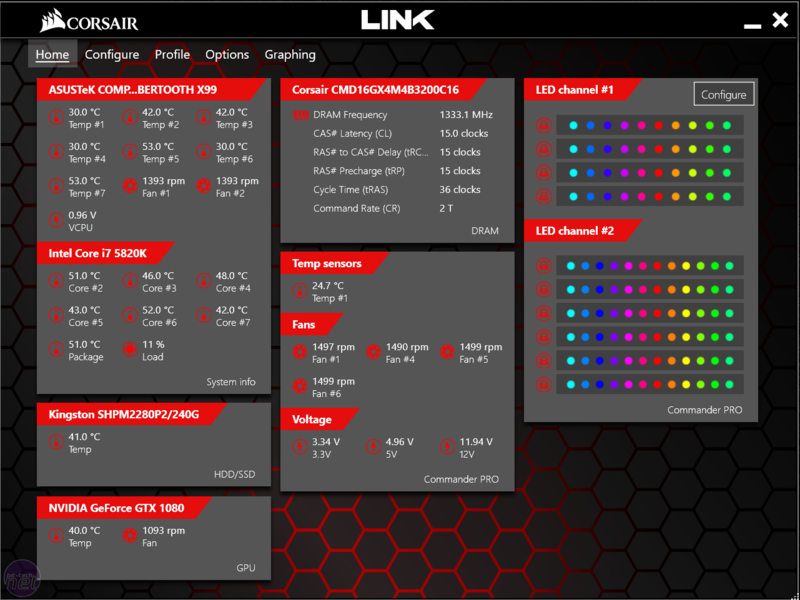 The USB 2.0 headers allow you to connect other Corsair Link-enabled hardware such as a PSU or a liquid-cooler for further integration and control. The downside? Well, it doesn't come cheap. It's very functional, though, so if you want to have control via software without having to open multiple programs, it's certainly worth taking a look.